After the BlackBerry Bold 9000 was initially launched with one of the finest QWERTY keyboards to ever grace a smartphone, there were many who said that it would be fantastic to have that physical keyboard on the device combined with a touchscreen. And that is what the BlackBerry Bold Touch 9900 (Dakota) and 9930 (Montana) are all about. The former is the GSM variant of the phone while the latter is the CDMA version that appears in the video. We can also tell from the video that as expected, the Bold Touch will be running BlackBerry OS 6.1. We recently reported on a leaked spec sheet that gave away some of the details of the Dakota which, as we said, is the GSM version of the BlackBerry Bold Touch. And from those specs we can compute that the display on the Bold Touch will offer a slightly larger (.2 inches) display when compared to the original non-touchscreen BlackBerry Bold 9000. Perhaps the biggest improvement is with the processor which nearly doubles from 624MHz to 1.2GHz, nearly twice the speed of the original Bold which was the fastest 'Berry at the time of its release. It's said that RIM will release it's final '9XXX' numbered phone on December 21, 2012.
didnt the blackberry torch have a qwerty and a touch screen? Yes, the Torch has a qwerty and a touch screen, however, it is a slider form factor, with a flattened keyboard.. 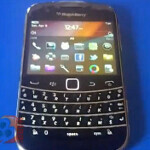 The 9900/9930 will be a more traditional Blackberry device like that of the Bold 9000, 9700, 9780. I recently bought a Motorola Milestone and I have had soo much problems with it because of the upgrades they delivered,I was thinking of buying another Android smartphone but with all of the fragmentation there's that of the brands had different versions of the same upgrade some are good some are not you don't know what to buy that's why I'm thinking on going back to blackberry again they work really great good signal,great keyboard maybe still missing other things but at the end is a phone first and the other stuff are a plus that maybe you don't even use. @IPHONEGUY101 - Really? You'd leave the iPhone for the BB Touch?? I came from a BB Bold 9650, sure there are things I miss about the BB but my iPhone more than makes up for those things. I love the BB qwerty key board on my curve and will really appreciate the touch screen on this new version. I just brought the new Samsung google S which I have hard time to text with the funny feel on touch screen. I wonder if the new BB touch will support the hand writing input ? ?